The Big 12 lost one of the best national TV draws in college football (Nebraska), the most popular college team in its largest and fastest-growing market outside of the state of Texas (Colorado) and its conference championship… and then signs a contract for a 350% increase for its second tier cable football rights with Fox. Did Rupert Murdoch suddenly feel the need to go on a shopping free now that he doesn’t have to pay Glenn Beck anymore? Is Dan Beebe getting a G5 and a pile of money so that Fox can cash in an insurance policy on Iowa State? What gives? Well, let’s take a look at some demographic shifts of the overall TV audience, how it has affected Fox’s most important property, American Idol, and how all of this explains why sports TV rights fees are generally going through the roof right now. (1) More Old People Watch TV Than Young People – If you know anything about TV advertising, the overall Nielsen rating that a lot of networks like to trump in press releases is completely irrelevant. The fact that CBS is the #1 watched TV network overall with top overall-rated shows in several categories has little bearing on what they are able to charge in terms of advertising rates. Instead, the Nielsen number that really matters is what a show draws in the Age 18-49 demographic and, increasingly, the Age 18-34 demographic. Historically, this emphasis on younger viewers has been justified with notions that older people are less likely to switch brands or purchase high-end products. However, that really isn’t true anymore, as people over 50 generally have higher incomes and have shown to have more discretionary spending than their younger counterparts. Now, the reasoning is a bit different: younger viewers are simply scarcer, therefore advertisers pay a premium to reach them. Even though older viewers actually have more spending power than younger viewers, those older viewers watch more TV overall and can be reached throughout the day by placing ads on less expensive shows. With that type of advertising rate disparity, TV networks (both broadcast and cable) are continuously on the search for programming that attracts those younger viewers. (2) More Women Watch TV Than Men – Here’s a fairly shocking statistic: out of the 63 prime time shows that were on the 5 major broadcast networks (for the purposes of this discussion, The CW gets counted as a “major network”) during the 2009-10 season, only 6 drew more male viewers than female viewers. 6 out of 63. Three of those shows (The Simpsons, Family Guy and The Cleveland Show) are part of the Sunday night Fox comedy bloc that gets a lead-in from NFL games for half of the season. Another one of those shows (24) is no longer on the air, a different one (Fringe) has been moved to a low-rated Friday night time slot and the last one (Chuck) has been on the cancellation watch list for a couple of years. If you’ve ever wondered why ABC keeps churning out shrill high-budget prime time soap operas from Shonda Rhimes, there’s your answer. Simply put, the TV networks are badly in need of a sausage fest and can’t seem to create any. (3) More People Are Using DVRs – Nielsen recently reported that DVRs are in 38% of all U.S. households as of September 2010, exhibiting extremely rapid growth as that number stood at less than 5% in 2006. Those users of DVRs are also younger and more affluent than the average television viewer. While Nielsen argues that DVR users still watch commercials in decent numbers, the reality of it is that the attraction of the DVR is to be able to skip those ads (cutting down an hour-long show with commercials into around a 40-minute show without them). As DVR penetration continues to grow (and frankly, I thought that current 38% number seemed fairly low), more and more people are going to be avoiding commercials like the plague. These changes in who watches TV and how they watch it has had some fairly interesting implications in pop culture. For instance, a couple of weeks ago, the American Idol audience shockingly voted off (or more accurately, did not vote enough for) widely-perceived front-runner Pia Toscano, meaning that she placed ninth and had a shorter run on Fox than The Heights. It was enough to make J-Lo start crying uncontrollably while Steven Tyler rose from his crypt and started bashing America’s passion. Now, seeing that Pia was clearly the top pure singer while also being the best-looking of the competitors, that typically indicates a Charlie Sheen bi-winning combination. However, when looking at the demographics for American Idol, it reflects general TV viewing trends: its audience is getting older and skewing much more to the female side. My impression is that these older women prefer the John Mayer soulful acoustic guitar-types as opposed to the hot young divas, which is the main reason why (1) soulful acoustic guitar-types have won American Idol for the past two seasons, (2) 5 out of the last 6 American Idol winners were male and (3) only 2 American Idol contestants left on this year’s show out of 8 are female (rose jacket Rod Stewart copy Paul McDonald became the first male eliminated since the initial public vote cutdown to the top 13). What American Idol has going for it, though, is that people still generally watch it live. In the latest week where figures are available, only 9% of American Idol Wednesday viewers watched it on DVR compared to 29% of the viewers of Modern Family and 28% of the viewers of Grey’s Anatomy. Add in that it still draws a fairly good percentage of the younger demographics compared to most shows on television and it is a complete ratings cash cow for Fox. Last year, American Idol was able to charge over three times as much per 30-second ad spot compared to Dancing with the Stars, the latter of which actually draws a higher number of total viewers but a lower number in the Age 18-49 demo. So, when looking at how the TV audience has shifted, it has become clear what type of program obtains a premium greater than any other: the program that draws the age 18-34 male that watches it live. Let’s take me as an example of the target demo. I’m a professional 33-year old male that’s about a loyal to TV shows as Antonio Cromartie, can count on one hand the number of scripted TV shows that I watch regularly, and will purposely watch all of such shows on my DVR in order to avoid a single moment of watching any commercials. I don’t know about you, but I put my DVR right next to food and water on Maslow’s hierarchy of needs. The catch, though, is that I watch a lot of sports. Even better, I actually watch them live with commercials. There is no better vehicle to draw me, a member of the most valuable demographic of all (the male under 35), than sports… and there are tons of people like me in that respect. Sports have become one of the safest and highest-grossing buys for media companies. There are no coked-up, petulant stars to deal with. Well, at least not a lot of them. The only “winning” is done on the field. Sports are somewhat cheap to produce. Sports are true reality television, almost immune to being DVRed. Advertisers love that. There is a built-in following whose interest doesn’t wane with time. Even the strongest TV series are canceled. Try taking Alabama-Auburn off the air. The success rate of new scripted TV shows has become abysmal – ABC may end up not renewing any of its new shows from this season. In contrast, sports programs are considered to have “high floors” – ratings may not necessarily go through the roof for every single game, but there’s always a good base of viewers , that base includes a lot of members of the most valuable demo, and those viewers watch it live. The Nielsen DVR report linked above stated that sports and news programs are watched on DVRs the least of any TV categories. Does this necessarily mean that all sports rights fees will necessarily rise at such dramatic rates? The Pac-12 is looking for even a better deal than the Big 12 (you can count me in as someone that’s more skeptical that they’ll hit those numbers) and the Big East is looking at a possible tripling of its current rights fees. One ongoing negotiation that may be a better indicator of where rights fees might go for those two conferences is for the NHL, which is a league whose current deal was signed when it was at rock bottom in terms of popularity, has had a resurgence in a couple of key markets (Chicago and Boston), but still largely has a regional as opposed to a national fan base. The NHL is looking for a substantial increase of around 2.5 times the current deal with Comcast/NBC most likely being retained as the broadcasting partner. A rising tide lifts all ships in an outright manner, but where the conferences sit relatively each other will likely remain the same: the SEC and Big Ten at the top, the ACC, Big 12 and Pac-12 in the next tier, the Big East at the next level, and then everyone else. Similarly at the pro level, the NFL stands alone at the top, NBA and Major League Baseball are in the next tier, and the NHL will be behind them. Still, the circumstances are good for all sports entities. While the rise of Internet streaming and mobile devices are going to complicate matters for sports leagues to continue cashing in on cable dollars over the next decade, they’re all getting the benefit of a revenue boom today. Back in the fall, the Big East extended an “invitation” to Villanova to move up from Division I-AA football and join the football side of the conference. After several postponements on a decision by Villanova, the school’s Board of Trustees was finally prepared to vote today to approve the football upgrade. 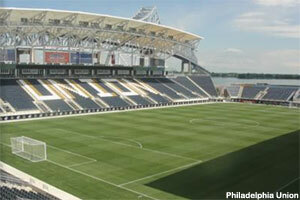 The issue appears to be Villanova’s choice of 18,500-seat PPL Park as a home football venue, which is the soccer home to the MLS Philadelphia Union. I would certainly understand the hesitancy on the part of the other Big East football schools… if it weren’t for the fact that PPL Park has been well-known as the only realistic stadium option for Villanova for around 5 months now. Regardless of whether one believes that Villanova joining Big East football is a good idea, it appears to be disingenuous on its face that some of the conference’s football members brought up the stadium situation that they’ve known about for quite awhile at the very last minute. The New York Daily News reported today that 75% of the Big East’s football members would need to approve the upgrade, which means that it requires a 6-3 majority. What’s interesting is that the scuttlebutt among Villanova insiders is that the Big East members that are blocking the process are Pitt, Rutgers, Syracuse and West Virginia as opposed to the newer members. (See the 4/11 9:37 am post from the publisher of Rivals site VUSports.com.) It doesn’t surprise me to see Pitt, Rutgers and West Virginia up there, but the talk about Syracuse having objections is quite jarring as the Orange (along with UConn) have the longest conference relationship with Villanova of any of the football schools. I explained the rationale for the Big East prodding Villanova to move up in football in my last post: (1) approval of any all-sports expansion (including the addition TCU) by the Catholic members was predicated on Villanova getting a chance to move up and (2) none of the potential expansion candidates from C-USA would clearly add enough football revenue to risk diluting the conference’s basketball revenue even further. That’s not to say adding Villanova would really do much for Big East football competitively, but they were a necessary political mechanism to obtain the votes for football expansion overall with TCU (which virtually everyone agrees was a great move). The Big East released a statement that it would continue to perform “due diligence” on the Villanova upgrade. What I don’t understand is what’s going to change over the next few months – the PPL Park plan “is what it is” and there aren’t any alternative options for Villanova. If Pitt, Rutgers and others don’t like the Villanova proposal today, then they’re not going to like it in June. Everyone involved would be best served by an up-or-down vote ASAP instead of dragging this out further.